This collection of essays examines the importance of virtue, corruption, and self-interest in the contexts of different political and historic settings. The book spans historic time frames (from the Glorious Revolution through the American and French Revolutions to the present), contrasts cultures (England, British America, the United States, France, Spain and its Empire), and represents the efforts of scholars from analytically distinct disciplines (political science, political theory, philosophy, intellectual and social history). The idea for this volume developed from The Lawrence Henry Gipson Institute for Eighteenth-Century Studies at Lehigh University. The Gipson Institute was established in 1972 as a memorial to the outstanding historian who was the recipient of the 1950 Bancroft Prize and the 1962 Pulitzer Prize for selected volumes in his British Empire Series. The chief aim of the Gipson Institute has been to promote an understanding of the eighteenth century from a variety of disciplinary perspectives. Conceptions of virtue and corruption have been central in the study of politics and history since at least the time of Plato and Aristotle. But while these concepts can be seen as significant in the works of Thomas Hobbes and John Locke, for instance, they are—beginning with Bernard Mandeville's Fable of the Bees (1714)—thematic of the eighteenth century. Mandeville's assault on the feudal ethos and the morality of the traditional world is treated in a nonsatirical and systematic manner in Adam Smith's An Inquiry into the Nature and Causes of the Wealth of Nations (1776). There, Smith argues that the unrestricted pursuit of individual self-interest would create a harmonious public order where the benefits of economic growth would trickle down to all members of civil society. Not until the middle of the next century do the ethics of market liberalism come under systematic attack—by Karl Marx, who in his critique of capitalism seeks a dialectical return to the organic community of feudalism as well as the unleashing of the potentialities of social individualism. In the hope of gaining new insights and fresh perspectives on this debate—and in the imperial spirit of Lawrence Gipson―the institute asked not only intellectual and social historians, but also political theorists and political scientists, to contribute to the volume. 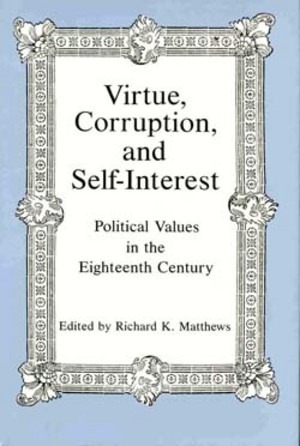 In addition, the institute asked scholars of the French and Spanish empires to think about virtue and corruption themes as they applied to their scholarly frames of reference.